Just who’s silly idea was this 1001 Books lark? I really must have my head read. which I have decided to tackle for the Off the Shelf challenge, my inter-library order arrived today. 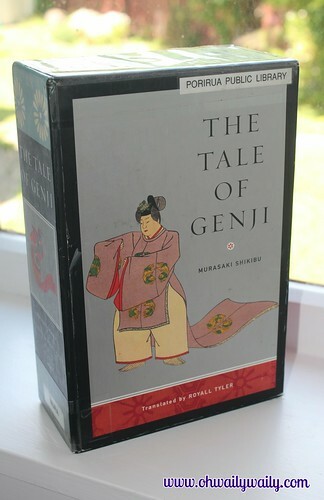 It was The Tale of Genji. 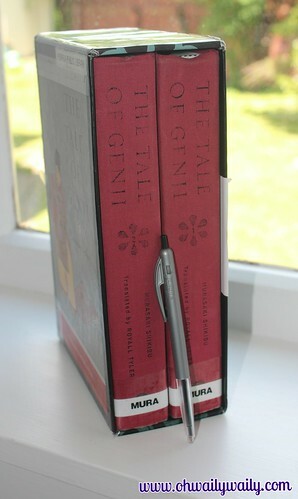 I thought it would be a largish volume, similar to but smaller than my copy of Don Quixote. Hah, I say. Here is the monster two volumes for your viewing (and laughing at me) pleasure. Not laughing at me? It’s pretty, but not daunting? Here’s a shot for scale then. I can tell you that I had a nice twenty minute weights workout carrying that home from the library. I had to swap arms at least three times as it is so heavy. Still, it is pretty but I may go MIA when I start to read it. 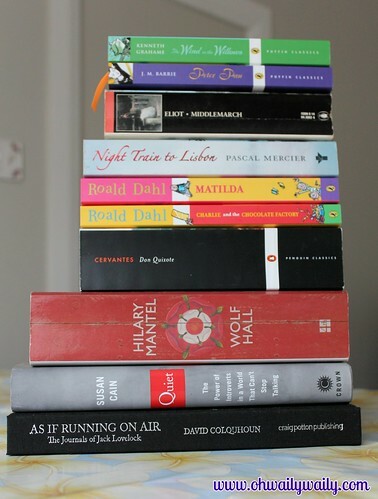 On a totally different, but still bookish subject, I’m in love with a set of bookends. The Oh Waily family headed out to the airport this morning to pick up Mr Oh Waily from his first work trip of the year, and while doing so had a little look around one of the souvenir shops. This shop has a couple of trolls (bigger than me) as decoration and a wall devoted to Weta Workshop creations. I had no idea that they have had involvement with anything Wind in the Willows, so I was surprised to see Ratty, Mole, Badger and Toad on their shelves. Rather timely as I have this volume on my OtS list (see photograph above). I didn’t take a photograph, but here is a link to their online shop for you to see. I promise you they are fabulous in real life. If you all want to chip in a couple of dollars, I might manage to save up and get them for next Christmas. But only if I can find somewhere high up out of the reach of inquisitive little hands. Definitely for the adult fans of WitW, not the little ones. How is your bookish year beginning? It’s promising to hear that two of my OtS books are enjoyable. As for Rafa arms, just shoot me if I start posting photos of my new, improved “guns” in muscle shirts – okay? Friends don’t let friends wear muscle shirts (male or female) ! How is Kafka on the Shore? Hopefully the sort of book you were expecting it to be.